Learn the facts about the very few rapid detox facilities throughout the country. All patients are seen by our “Board Certified” RDD physician for necessary pre-exams to make certain the patient has no serious medical issues and to ensure that the patient is a good candidate for the treatment. All patients receive a comprehensive pre-exam including complete physical and medical evaluation, extensive blood tests, urinalysis, drug screen, EKG, and other testing if deemed necessary. Anesthesia evaluation is performed prior to the actual detoxification. RDD Center never misleads a patient by mentioning unwarranted mental conditions and useless tests to impress and fool the average person that does not have the medical knowledge to know the difference. Some rapid detox programs purposely use marketing tactics that mention certain tests that sound like a new medical breakthrough in diagnostic testing. Some facilities lead the patient to believe that the extreme cost of their program is well worth it because they receive tests such as Brains Scans, Brain Chemistry Testing and Neurotransmitter Testing when in fact no such tests are actually performed once the patient arrives. These tests have no credibility even if they are performed and are of no value. Mention of such tests misleads the addicted patient into the false hope that these tests lead to a treatment to “fix their brain” and correct a person’s drug seeking behavior. We encourage you to read the facts about these tests on our website. Many patients are falsely diagnosed with ADD, Bipolar. We feel those disorders are highly over diagnosed by doctors not competent to make such claims. The RDD Method™ recognizes that this is a major medical procedure and it is prudent to be performed in a facility. Our patient’s safety and well being are most important and a top priority, therefore our detoxification procedure is always performed in a private medical facility. All patient records are held in strict confidence and we abide by all HIPPA privacy rules. We understand that privacy is very important to our patients. RDD Center can ensure proper medical care by our experienced staff in a safe and completely confidential setting. Office environments do not provide access to the proper and necessary medical care and monitoring that a fully equipped OR at a Surgical Center provides. No anesthesia services should ever be performed unless the patient is in a fully equipped operating room. Patients undergoing the rapid detox procedure need an environment with access to all the essential medical equipment and experienced staff required to treat even the most complex conditions. The RDD Method™ realizes the longer a patient is under anesthesia, the more chance of complications. We have perfected our procedure to approximately 1 hour under anesthesia. Our experienced “board certified” anesthesiologist and our years of experience have enabled us to make many advancements improving the outcome and the time necessary under general anesthesia. Our knowledge, years of experience and the development of new and improved rapid detox techniques have shown that lengthy anesthesia is not necessary. Some rapid detox facilities claim 4-8 hours of anesthesia is necessary to complete the opiate detoxification so the patient will not wake up in withdrawals which is simply not true. Our vast experience proves this is unnecessary. Putting the patient at great risk under lengthy anesthesia is not necessary and in fact, can be dangerous. Some of the newer facilities that do the rapid detox treatment do not have years of experience and continue to use the “old” way of rapid detox with 4-8 hours under general anesthesia. We have found that the few newer rapid detox programs that promote lengthy anesthesia is an indication that the anesthesiologist has little experience and is self trained by acquiring “outdated and old” information found in medical journals on the internet from 15 years ago when the rapid detox was first developed. Some facilities lack experience and knowledge about the advances that have been made with the rapid detox treatment. The RDD Method™ recognizes the importance of experienced “Board Certified” physicians present in the Operating Room at all times while the patient is undergoing the detoxification process. Post detox treatment care continues with our physicians remaining at the facility to properly monitor our patients all night after the rapid detox procedure. This ensures the highest level of professional care and safety. When patients are ready for discharge from the facility, an RDD physician visits and continues to monitor patients daily until they are ready to go home. Other rapid detox programs usually have only 1 physician handling the entire program and only 1 physician present during the entire detoxification procedure. Surprisingly, some rapid detox programs do not provide “board certified” physicians. We recommend that you check all physician certification. This also establishes that you are being treated by a knowledgeable expert in the field. The RDD Method™ realizes that this is a major medical treatment; therefore it is necessary to have a physician “on-duty” at the facility post detox procedure to monitor our patients until they are ready for discharge. RDD Method™ also provides circulating paramedics, RN’s and one-on-one private duty bedside nursing care for each patient for the entire facility stay. Highly skilled RDD Wellness Center staff members, RN’s, Paramedics and our physician remain with the patient post detox procedure to monitor the RDD patients. Once the patient is discharged from the facility they return to their private hotel room for a few days of rest and continued care and observation. Patients continue to be seen and monitored by our physicians daily and our highly skilled Paramedics remain on the premises of the hotel, available at all times, making rounds and visiting patients, 24 hours a day until discharge. Some rapid detox programs discharge the patient to a nearby hotel only hours after the detox procedure with just a doctor “on-call”. This setting puts a patient at tremendous risk with coverage by just family members or hired staff should medical complications or an emergency arise. These settings are totally unacceptable and dangerous and can lead to complications that can be fatal. Some facilities accept scheduling for patients 3-4 days per week limiting the individual attention, care and coverage that recently detoxed patients receive. The RDD Method™ utilizes Naltrexone which is mandatory for the RDD treatment. RDD does not charge extra for Naltrexone, it is included with the treatment fee. Naltrexone is non-narcotic, non-addicting, non-opiate and does not cause any withdrawal when stopped. Naltrexone is simply an opiate blocking medication necessary for all post procedure patients. Patients receive the oral “pill” form of Naltrexone or the highly recommended “IM” injectable Naltrexone which slowly releases over time lasting for 4 weeks. Use of Naltrexone is mandatory after the detox procedure to prevent the residual opiate that remains in the fat and liver from reattaching to the clean opiate receptors. For some drugs such as Methadone and Subutex/Suboxone®, this can take weeks for the body to metabolize the drug out of distant tissues. Those patients detoxing off of Methadone or Subutex/Suboxone® are required to have the Naltrexone injection to ensure the long lasting blocking effect that only this delivery system can ensure. Naltrexone never causes withdrawal when discontinued. See our “Naltrexone information” for details about Naltrexone Therapy. We provide patients with a prescription for the “oral” pill form of Naltrexone for up to one year if the patient chooses to remain on this drug for continued sobriety. The prescription can be filled at their local pharmacy. Some rapid detox programs do not include Naltrexone Therapy or they often charge over $1000 for the injection. The rapid detox programs that use Suboxone®/Subutex do not use Naltrexone because Suboxone®/Subutex are opiate drugs, therefore Naltrexone cannot be used. Some facilities surprisingly know very little about Naltrexone which is an important factor to maintain sobriety and ensures a successful detox without the chance of the residual opiate reattaching to the “now clean” receptors. Some patients are told that weaning down and stopping Suboxone® is a mild withdrawal. This is far from the truth. Withdrawal can last 20-60 days and be very intense. Patients are routinely told that the drug Suboxone®/Subutex, a buprenorphine is an opiate blocker when in fact it is a powerful and very addicting opiate that is 20-30 times more potent than even Morphine. The RDD Center has an arrangement with a hotel that is included in the price. The RDD Center provides lodging for 3 nights. Our masseuse is available for an “in room” professional massage. The RDD Method™ is known for our compassionate care and concern for our patients. Once patients return to their home, we understand that patients may need help with medication for sleep, energy, appetite, anxiety, etc. We provide this to help patients from seeking illicit medication by other means. Needed medication is available to all patients. The medication we offer patients is for their comfort short term and never addicting. Medications are prescribed for 1 week at a time. We must be assured that someone other than the patient controls and dispenses the medication. We listen to our patient’s needs and call in prescriptions to their local pharmacy in whichever state they live. The majority of our patients travel to us from all over the country so we routinely call in medication if needed, to the patient’s local pharmacy. Our patients deserve our continued coverage for at least a month. We encourage calls should there be any questions or concerns, 24 hours a day, 7 days a week including holidays. The RDD Center makes available to the patient or family members’ immediate access at all times for consultation and medical guidance with our head nurse and experienced staff. This coverage reassures them that they are not left on their own to “deal with it”. The more we help our patients, the more successful, appreciative and compliant they are. Our years of experience and vast medical knowledge about rapid detox patients, assures the patient that we can answer all questions and offer excellent medical guidance. Your calls never go unanswered with long waits for a call back. If we are on other calls, we take a message and call back in a timely manner. Other detox programs may not have knowledgeable medical staff immediately available at all times. Other detox programs have limited follow-up care and provide little or no coverage and assistance to patients once they are home. Most doctors feel their treatment is over and do not call in any needed prescriptions once the patient is discharged. RDD does not encourage or recommend a patient on certain opiates such as Suboxone®/Subutex or Methadone to switch over to a traditional opiate for a week or two prior to a rapid detox. The RDD Method™ recognizes that this makes absolutely no sense due to the huge amount of a traditional opiate that is needed to replace milligram per milligram of the opiate drug Methadone. Switching over to a traditional opiate from Suboxone®/Subutex generally does not allow the traditional opiate to get on the opiate receptors with Suboxone®/Subutex because the buprenorhine (the active opiate in this drug) has such a strong binding affinity to the opiate receptors. Because of this strong binding affinity, it hinders the uptake of a traditional opiate and takes a few weeks for the patient’s receptors to metabolize and weaken/dislodge the Suboxone®/Subutex from the opiate receptor to allow the full attachment of a traditional opiate. In this situation the patient does not get the benefit of a traditional opiate and more than likely experiences withdrawal from using a traditional opiate due to the decreased opiate doses. The patient is then tempted to use larger amounts of opiates which could cause an overdose. Facilities that promote such a switch are not experienced in Methadone and Suboxone®/Subutex rapid detox. The RDD Method™ never uses Suboxone®/Subutex; a “replacement opiate” drug. Suboxone® is our 3rd most common drug addiction that patients come to us for detox. Approximately 1/3 of the patients we detox are addicted to Subutex/Suboxone®. We understand the disappointment and struggle the patient encounters after spending thousands of dollars and realizing they must now seek out another detoxification for the Suboxone®/Subutex addiction. The RDD Method™ strives to give each patient an affordable, trustworthy and honest rapid detox so they eliminate the need for future use of opiates. We accomplish this by treating our patients with a true rapid detox procedure under anesthesia, never using replacement opiates. Some rapid detox programs advertise that they do a rapid detox but do not actually do what is known as a rapid detox under anesthesia. Patients seeking a detoxification are never told about this type of detox until after they are given a powerful benzodiazepine per IV infusion to induce unconsciousness. They then receive an IV infusion of Buprenex (liquid Subutex) which is the opiate; Buprenorphine. The infusion of this strong opiate drug readily attaches to the opiate receptors with a strong binding affinity, pushing off the original opiate drug currently on the opiate receptors. When the patient awakens they start on very high doses of Subutex/Suboxone®, the sublingual oral form of the opiate Buprenorphine. They remain on this replacement opiate drug for months. Upon finding out they are now addicted to an opiate typically more powerful than the opiate they were seeking a detox from, they are left to seek out a doctor in their area that will continue the maintenance dosing of this drug. Suboxone®/Subutex has the analgesic power 20-30 times stronger than morphine (per FDA studies and documentation, see FDA letter) and most find it impossible to “wean” down and stop the drug. Some detox centers tell patients they will be on Suboxone®/Subutex for only a few months to a year. We have heard patients have been told “months of use is needed to reset their receptors” when in fact it is a very financially lucrative treatment for physicians requiring little patient care on their part. Some rehab facilities use Suboxone® claiming this is a detox, when it is nothing but a switch to another opiate typically causing withdrawal symptoms when the patient is discharged from treatment. RDD Center feels it is necessary to be honest about the total cost of treatment and recognize that all patients should receive the best of care included in the price. The RDD Center developed an affordable “all-inclusive” price of $7,900 with no surprises. Our price of $7,900 includes the entire cost of the program with consistent quality care for each patient. Once you arrive at the airport, everything is provided. This includes all shuttle services/transportation, medication, pre and post exams, detoxification procedure, lodging, patient’s choice of 3 delivery forms of Naltrexone therapy, etc. This is RDD Center’s promise to our patients; there are no hidden or additional charges or added taxes whatsoever. 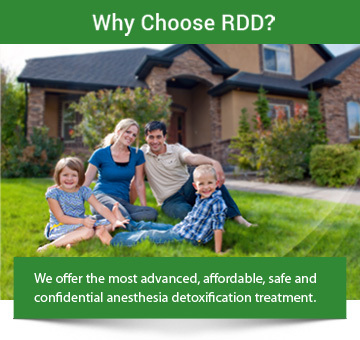 RDD Center does not require a nonrefundable deposit prior to coming for treatment, nor do we discount for cash payment. We owe the same amount of taxes no matter how our patients pay for the procedure and do not encourage discounts for cash payments. Frankly, we think patients, and we would agree, find these discount offers a bit suspicious and quite unusual for a medical facility. Some rapid detox centers have exorbitant charges making it cost prohibitive and impossible for most patients to receive the help they truly need. Others may quote a price that seems affordable but add many extra charges and surprise charges once the patient arrives for treatment. These budget programs risk proper care by cutting corners which limits proper pre-procedure testing and the integrity of care a patient receives. Also, promises of certain length of care, covered costs of medications, etc. come with contracted conditions that most patients find impossible to comply with, so agreed upon terms become voided. These program cuts affect the quality and safety of treatment and care.